It’s a Mousetalgia triple play this holiday week as we celebrate the opening of Lucasfilm’s “Rogue One – A Star Wars Story,” taste test Disneyland’s holiday offerings and chat about Verve’s new release “Jazz Loves Disney.” First, we offer our initial spoiler-free reactions to the latest film from the Star Wars galaxy far, far away. From Michael Giacchino’s new score to some dicey CGI, Rogue One offers a lot to digest, and we do our best to share some first impressions of this new format in the world of Star Wars films. Then, Kristen goes back to Disneyland once again to talk about tasting holiday treats, and shares more feedback about Storyteller Cafe, the Festival of Holidays, and the festive menu at Le Salon Nouveau. Finally, we speak with Boualem Lamhene, an executive director with Disney who founded the We Love Disney brand in France which is spreading around the world. We speak with Lamhene about the latest release in the series, “Jazz Loves Disney,” and we discuss the creative process behind the new album. Plus – Star Wars trivia, and a special feature: Drew Tablak performing Silent Night at Candlelight 2016. 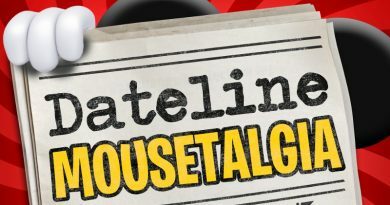 Dateline Mousetalgia – Episode 12 – Characters in Costume and Downtown Disney Updates!